This is the second of a two-part article pertaining to the new PMBOK® Guide. In the first part, I highlighted the changes. In this second part, I suggest an approach to digesting the new version and share some thoughts about the exam changes. Except for the CAPM, PMI exams are not specifically based on the PMBOK® Guide or any PMI standard. They are based on analysis of what people do in a particular role as outlined in the Role Delineation Study (RDS) and the Exam Content Outline (ECO) that is created from that study. The PMBOK® Guide and other standards ensure language and terminology consistency and they help ensure that questions are rooted in the profession’s common, best practices. In fact, the biggest changes to a PMI exam are initiated by a change to the RDS and resulting ECO. Theoretically, then, there is no reason to expect huge changes to the exam in March. The other thing to keep in mind is that the PMBOK® Guide may be over 750 pages, but the PMP exam is still 200 questions. The PMP exam has always been a little bit about a lot of things, and that isn’t changing. To the extent that the PMBOK® Guide is a key source for PMP certification exam prep, the revised exam will now be a little bit about even more…which makes it even shallower and wider. While I don’t think there’s reason to expect a significantly more difficult exam in March, I would recommend waiting until a couple of months after March and paying attention to informal feedback about the exam on LinkedIn and other social media. People will share their perceptions of the exam in social media groups which can be helpful as one prepares for the test. How In The World Can I Absorb All These Changes? First, note that there are three parts to the new PMBOK® Guide. Part 1 includes the Introduction, Environment, Role of the Project Manager, and the Knowledge Areas. 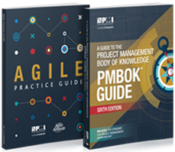 This is the vast majority of the book and goes into detail on the processes, inputs, tools and techniques, and outputs.If you are already familiar with the PMBOK® Guide, you can probably keep track of where you are at while reading this section. Part 2 If you are new to the PMBOK® Guide, however, you might want to start with Part 2, The Standard for Project Management. This covers many of the same concepts in Part 1 but at a higher level. More importantly, this section goes through the processes by Process Group (PG) rather than by Knowledge Area (KA), which is helpful to understand what project managers really do (PGs), as opposed to what they know (KAs). The PMP exam is organized by PG rather than KA, so this is also a good resource for certification exam prep. Plus, the descriptions of the processes in Part 2 are described along with identification of the inputs and outputs only – without tools and definitions and descriptions of the inputs and outputs, making it less confusing for those not familiar with it. Part 3 also contains helpful information that might be worth looking at before going into the weeds in Part 1. Previous editions of the PMBOK® Guide included Appendix X1 with the new edition changes. However, in past editions, I was slow to get to the appendices because I wanted to get into the details. With this edition, assessing the enormity of the task quickly led me to these less “popular” sections of the PMBOK. Simply breaking it down will make it less overwhelming, easier to absorb, and will make and your training easier. Appendix X1. If you want to know what the changes are from the Fifth Edition, they are handily captured in Part 3’s Appendix X1. Not only are the changes identified, but the rules around construction of the PMBOK® Guide are listed here which is helpful. For example, “Outputs from one process should become an input into another process unless the output is a terminal output or embedded within another input such as project documents.” (page 640). That’s handy to know! This is discussed in Part 1, but it is easier to catch in Part 3. Appendix X3, X4, and X5 are very helpful in their summary presentation of information that is included at the beginning of each KA chapter. Specifically, X3 goes into how the project life cycle (adaptive, iterative, hybrid, etc.) impacts the processes described in Part 1, but it does so by Process Group. Again, this is helpful from the standpoint of understanding how project management really works. Appendix X4 and X5. These include all the Key Concepts that are presented at the beginning of each KA in Part 1. And Appendix X5 includes all the Tailoring Considerations needed for adaptive, iterative, and other life cycles that were identified at the beginning of each KA in Part 1. It is very helpful to have these sections consolidated in one place to review together, as opposed to reading the Key Concepts and Tailoring Considerations specific to each KA one chapter at a time. Appendix X6 presents a matrix summarizing which process utilizes each tool. It includes a reference guide for all the Tools and Techniques described in Part 1. Throughout Part 1, the tools are defined and described in detail the first time they are mentioned, then subsequent inclusions of the tool reference the original section where it was defined. Getting a sense of where and how the tools are used can be challenging. Appendix X6 shows where to find the detailed description of each tool. This makes it easy to look up where the tool is defined and where it is used. Overall, even for those of us who have been steeped in PMBOK-ese for many years, this new edition is a lot to digest. Taking a little time to assess how it’s organized yields a better approach to understanding it. I’d love to hear what your plans are for certification and your exam experience. Good luck! You bet. Hope it’s helpful.